A weird thing about me. I don’t really like milk chocolate all that much. Don’t get me wrong,I have chocolate cravings as much as the next hormonal woman. It is just that for me, the darker the chocolate the better. The one exception to that rule has been with hot chocolate. I love hot chocolate. I’d still prefer a rich dark flavor but a good creamy milk hot chocolate isn’t going to be met with scorn. On a recent trip to Las Vegas, a friend of mine,who is familiar with my hot chocolate appreciation, kept insisting that we needed to go to Serendipity 3 so that I could try their frozen hot chocolate. Frozen hot chocolate. That just sounds like a junior high school science fair project but who am I to deny the insistence of a chocolate loving friend. The expedition to Serendipity 3 began with four people but when we got there,and saw a long line, all but two of us bowed out. Some people just aren’t foodies and the dividing line between the two appears to be willing to stand outside for an hour in an unseasonably cold Las Vegas in order to try a dish. For this foodie, it was worth the wait. 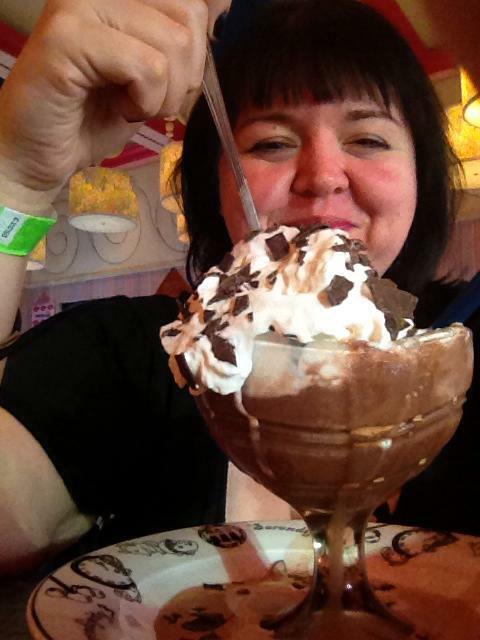 The first thing to be said about the frozen hot chocolate at Serendipity 3 in Las Vegas is that it is huge. I took this photo of myself with it to give a comparison to how big it was in relation to my head. Did I mention that I am lactose intolerant? Talk about taking a gamble in Las Vegas! Secondly, it is super messy. The hot chocolate is frozen to a consistency that reminded me of a fancier version of a Wendy’s frosty. Which means it melts super quickly. Their remedy is to sit the serving dish in a bowl so that the run off ends up in the bowl rather than all over the counter. This isn’t a time to have too much pride to wear your napkin as a bib. The taste itself is pretty much as the name would suggest. Imagine a creamy milk hot chocolate that has been stuck in the freezer and you wouldn’t be far off. A delight for a chocolate loving foodie looking for a bit of indulgence in Sin City. Plan on making it a meal in itself or share it with others because there is just so much of it that there won’t be room in your tummy for anything else. The next time I am in New York I will have to set aside some time to go to the original Serendipity and see how their version of the frozen hot chocolate compares to the Las Vegas version. This entry was posted in Eating Out and tagged Chocolate, Las Vegas. Bookmark the permalink.